Compliance and Regulatory for Higher Education and Industry! Let us take your organization to new heights! Heiland Consulting, LLC was started to assist higher education and industry make the most of their time, effort, and innovative processes by providing the necessary support for institutions to work through and better understand the requirements for regulatory compliance at an international, federal, regional, state, and local level. 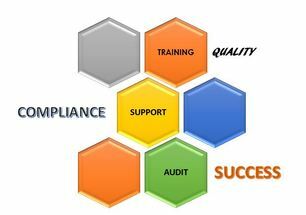 When freed from the concerns of legal and regulatory compliance requirements, your team has the time and focus to be more innovative and move your organization forward. Meet the team at Heiland Consulting, LLC. Linda Heiland serves as the President/CEO of Heiland Consulting, LLC as well as the lead consultant for the Higher Education sector of the company. She has over 18 years experience in higher education academic leadership with a focus on academic quality, curriculum development, accreditation and regulatory compliance. Linda has experience in both the public and proprietary education sector. (See link to Higher Education section for full resume and bio). Consultants - Heiland Consulting, LLC occasionally employs a team of very talented consultants in specialized areas. All consultants are fully vetted by the company and work under the Heiland Consulting, LLC umbrella. When consultants are employed for a specific project, the institution will be provided a detailed bio and informational packet of the consultant that they will be working with. Institutions have full approval rights over the assigned team for all work performed.